A short film starring two former Doctor Who companions is to be given its premiere at XpoNorth next month. Frazer Hines appeared in the TV series playing Jamie McCrimmon, a Highlander from the 18th Century. Author Diana Gabaldon drew some of her inspiration to set her Outlander books in Scotland after seeing a re-run of a 1960s episode featuring Hines. Hines appears in the new short drama, Sundown, with Caitlin Blackwood, a cousin of Hollywood star Karen Gillan. Blackwood appeared in Doctor Who opposite Matt Smith's Time Lord. 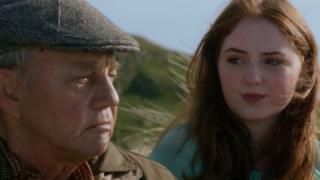 She played a young version of Amy Pond, a Doctor Who companion played by Inverness-born Gillan. After spending her early childhood in Northern Ireland, Blackwood moved with her family to Gillan's home city. Sundown was directed and co-written by Bafta-nominated director Ryan Hendrick. It tells the story of William, played by Hines, a man in his 70s who is taken on "a timeless journey" through the eyes of Blackwood's Abi to come to terms with his own mortality. XpoNorth is an annual creative industries festival held in Inverness. This year it is being held on 27 and 28 June.